The exam room is the part of the hospital where the history is taken and the physcial examination is performed. Consultations and preventative care occur in the exam room as well. 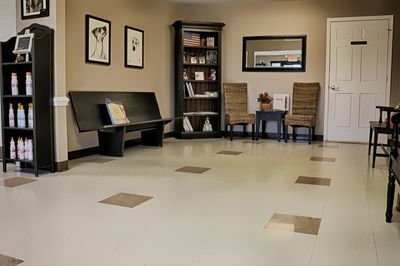 At Vanguard Veterinary Hospital, PLLC., we believe the education is important to increasing the quality of life of your pets, so we will also spend time at each visit to ensure any questions or concerns regarding your pet's health are fully addressed. The lobby at Vanguard Veterinary Hospital is designed to provide a comfortable, relaxing environment for our clients and their pets. 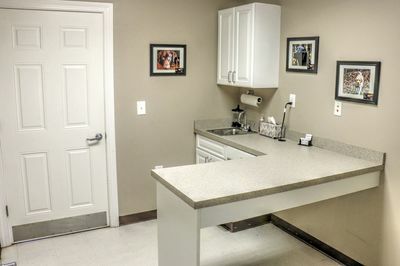 Vanguard Veterinary Hospital has over 2000 square feet of space dedicated to rehabilitation and sports medicine conditioning. 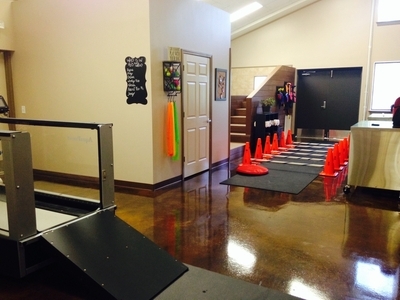 Through the utilization of strengthening exercises, stretches, physiotherapy and hydrotherapy, we can provide new options for any pet needing rehabilitation and/or pain relief from a variety of injuries or illnesses. We are able to work with clients to develop the best strengthening and exercise plans for these athletes as well as fix any performance weaknesses or gait dissymmetry. Our goal is to minimize or remove pain and to return each patient to their original level of athletic mobility and quality of life. 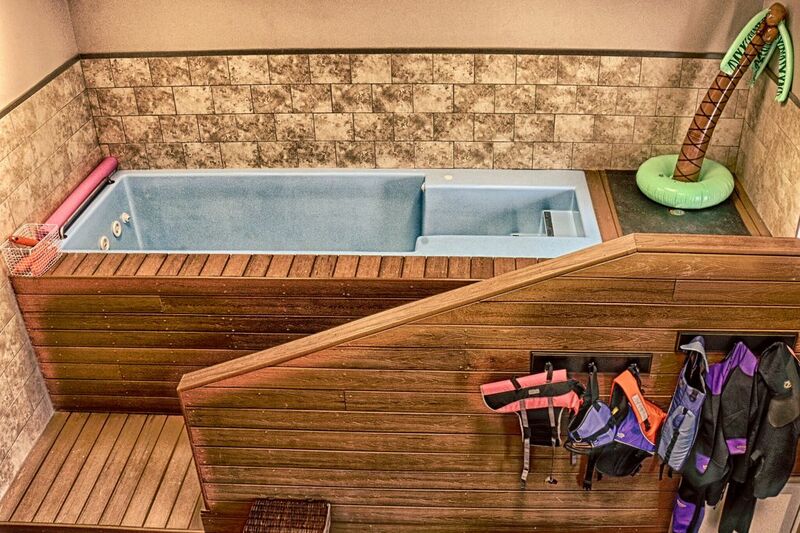 Hydrotherapy is an outstanding option for animals with soft tissue lameness, hip injury, knee injuries, elbow injuries, and spine injury or arthritis. It is also an excellent modality to condition canine athletes. 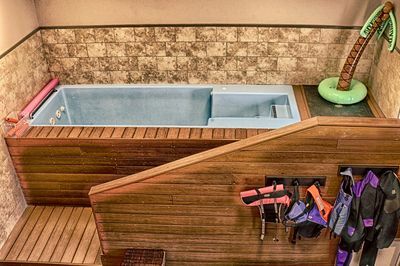 The hydrotherapy pool uses jets to create resistance in order to develop muscle strength while minimizing pressure on the musculoskeletal system. 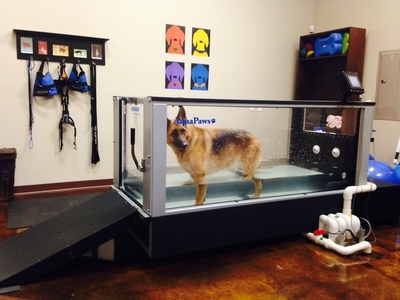 The water treadmill is used to strengthen and condition patients in a reduced pressure environment. This form of therapy is excellent for patients with osteoarthritis, spinal injuries, post-operative rehabilitation, pre-operative conditioning and lameness. The water treadmill can also be used to improve range of motion, enhance athletic performance, promote weight loss and provide pain relief in our patients. Our surgical suite is fully equipped with state of the art equipment, including a laparoscopy unit, electrocautery and suction. 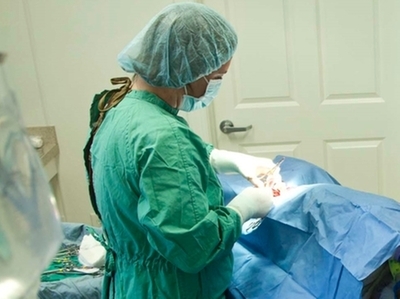 We are able to perform soft tissue, orthopedic and minimally invasive surgical procedures through the utilization of advanced technology. Full Anesthetic monitoring equipment and technician as well as patient body temperature control devices reduces the anesthetic risk to your pets.